This award represents a huge team effort by everyone within the organisation and I am extremely proud of everything they have achieved. Wood Group PSN (WGPSN) has been certified to the Australian Occupational Health and Safety Management (AS 4801) for the maintenance of Melbourne Water’s assets, capital engineering, procurement and construction works by leading assurance provider LRQA. 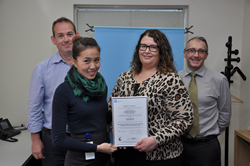 The certificate of approval was presented to Lauran Pan (WGPSN HESQ Engineer), Rob Gillies (WGPSN Assignment Manager) and Stephen Answerth (Melbourne Water Contract Manager) by LRQA Key Account Manager Fiona Maybery in Melbourne. WGPSN embarked on a journey to improve their Safety Management System and Customer Satisfaction 8 months ago. WGPSN’s Assignment Manager, Rob Gillies stated that “this award represents a huge team effort by everyone within the Organisation and I am extremely proud of everything they have achieved. Safety and assurance is a key core value in the business, and this certification represents a vital milestone in demonstrating this commitment”. This was echoed by Stephen Answerth, Melbourne Water’s Contract Manager, who commented on the importance of Safety to Melbourne Water (another LRQA certified organisation) and the strength of both organisations in facing challenges together and demonstrating continuous improvement towards a generative safety culture.